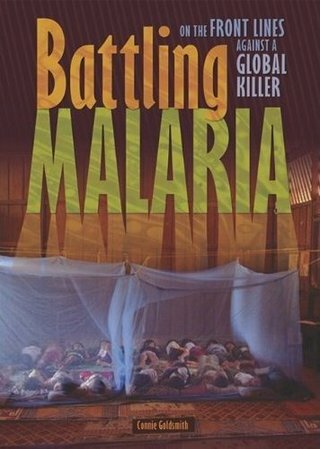 The Society of School Librarians International named "Battling Malaria" as best science book for grades 7 to 12 for 2011. I dedicated this book to the Bill and Melinda Gates Foundation for its extraordinary generosity in the fight against malaria, and to the thousands of doctors, nurses, and other healthcare workers who give their time and experience to fight malaria and other diseases of poverty around the world. U.S. physician Terrence Smith has worked in medical clinics in Thailand and Myanmar (also called Burma) in Southeast Asia. He describes a scene that is typical in these and many other nations around the world. "Mothers carry their children through the forest to the clinic in their arms or wrapped in a shawl on their backs," Smith says. "The children have malaria, and they are too weak to cry, too weak even to swat the flies away from their faces. The children don’t complain when they are in pain. The mothers are stoic and don’t complain either, even when they fear their children will die. Malaria is so common that it goes untreated.... Mothers usually don’t bring their children into the clinic until the child is very sick and suffering the complications of severe malaria, such as seizures or unconsciousness." If the World Health Organization (WHO; an agency of the United Nations) had a most wanted list of dreaded diseases, malaria would make the top three, along with HIV/AIDS and tuberculosis. Malaria sickens between three hundred million and five hundred million people around the world each year. That’s more than the combined population of the United States and Canada. Not only does malaria make a lot of people sick, it’s a major global killer. More than one million people die from malaria each year. In Africa one child dies of malaria every thirty seconds. On the day you read this chapter, malaria will kill three thousand people. Most of them will be young children. Malaria is caused by a tiny parasite. A parasite is an organism that lives in or on another organism known as the host. As they feed and reproduce, parasites often make their hosts sick. The malaria parasite spends part of its life cycle in humans and part in mosquitoes. The parasite needs both humans and mosquitoes to survive. People do not usually catch malaria from one another. In most cases, malaria passes from person to person by the bite of infected mosquitoes. Malaria has been sickening and killing people for thousands of years. In the mid-twentieth century, The WHO and other groups made great strides in wiping out the disease. They conquered malaria in some places and sharply curbed it in others. The victory was short-lived, however. In the late twentieth century, malaria stormed back in much of the world. Not only has malaria returned to some areas, it is also spreading to new areas. The disease has become more dangerous as well. It sickens more people than ever before and makes people sicker than in the past. About half the world’s people live in malaria-stricken countries. Many of these countries are among the poorest in the world. Countries cannot thrive when their citizens live with constant illness and poverty. Around the world, scientists, health workers, governments, and private organizations are working to prevent malaria, lessen its spread, and better treat people who get the disease. If we can control malaria, millions of people around the world will enjoy healthier lives.